When you need your rug to be repaired or restored, there simply is no better company to do it than Reilly’s Oriental Rug Cleaning. We have been serving residents in Northern New Jersey for over 100 years, keeping their rugs in pristine condition. Come to us for all your rug repair and restoration needs. There are many things that can damage your beloved rug. Some of them include pets, wear and tear among many other reasons. When this happens, it is possible to have your carpet repaired and restored to pristine condition. Rug and repair can take many forms. It can mean the repair of worn out edges, holes, moth damage, and more. Instead of throwing your torn rug away, there are various processes that we can take to restore your rug to perfect condition. What are the Benefits of Rug Repair and Restoration Services? When you have a rug or carpet that you are attached to and can’t bear to part with it, rug repair and restoration can help you restore it to its original condition. Rug repair and restoration also helps when you need to resize your rug. This can happen if you move to a new house and the rug cannot fit into the new space. Rug repair and restoration can help in the case of antique rugs and very special rugs with great intrinsic value. In such cases, they cannot be replaced and restoring them is the only option. If the carpet has a hole, the first step is to fix the foundation of the carpet. The next step is to sew the hole over with wool threads. When we are doing this, we use the same exact design of the carpet to maintain consistency. The next step involves trimming down the repaired area, so it matches the rest of the carpet in terms of height. After the hole is fixed, the repaired part is trimmed so that it is the same height as the rest of the pile. When you hire us for your carpet repair and restoration needs, you can rest assured that your beloved rug or carpet is in good hands. We have been repairing and restoring rugs for the last 100 years. With that level of experience, you can expect that the quality of our work will be outstanding. 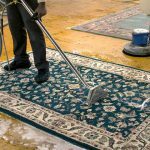 At Reilly’s Oriental Rug Cleaning, we have built our business around the needs of our customers. That is the reason why we keep our prices both competitive and transparent. This means that at any one time, you know that you are getting great value for your money. You also know exactly what you are paying for. Are you interested in using Reilly’s Rug and Carpet Cleaning’s rug repair and restoration services? Do not hesitate to call 201-445-0800 or email us at Info@RugClean.net for more inquiries.